A Sidelock Holder refers to an endmill holding arbor used in a milling machine, in which a grub screw from the side secures the milling cutter into the arbor. 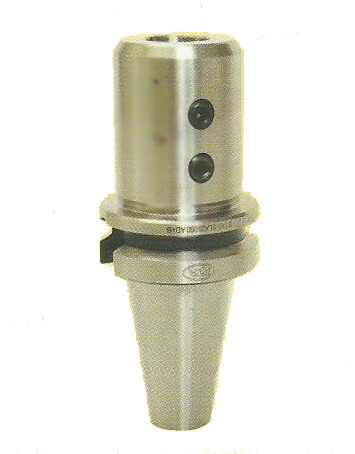 The grub screw tightens onto a "Weldon" flat machined on the milling cutters shank. A must for CNC Machine Centres. The main purpose is to hold cutters generally over 20mm in diameter and/or roughing milling cutter, as this sidelock clamping system is extremely strong and the endmill cutter cannot slip or spin in the arbor under heavy load. Various collet systems are perfect for accuracy and little runout, however if loaded up for a heavy cut, can often slip or spin in the collet (especially in older, worn collets). Hence, the Sidelock arbor is required allowing heavy metal removal. Sidelock arbors are usually dedicated to a particular cutter as a permanent tool, where tool height is already programmed and never requires new tool length set ups, only replacing of carbide insert (i.e. BT40 x 25mm sidelock holder can only ever hold a 20mm shank cutter). The opposite often applies for collet chucks that are versatile and cutters of different diameters can used. At ToolEngg.com we offer a large range of sidelock tool holders,for CNC milling machine centres and also conventional milling machines. SIDE LOCK HOLDER is a popular holder . SIDE LOCK HOLDER is available with different tapers to suit respective spindles. SIDE LOCK HOLDER is supplied in BT30, BT40, BT50, CT40, CT50, ISO30, ISO40,ISO50, HSK50, HSK63, HSK100 tapers. 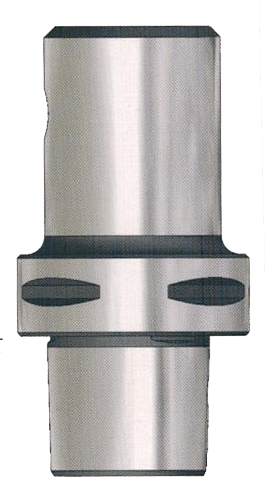 SIDE LOCK HOLDER can also be supplied with spindle tapers which are not mentioned here . SIDE LOCK HOLDER can hold straight shank cutting tools. SIDE LOCK HOLDER is generally supplied for metric shank cutting tools. However SIDE LOCK HOLDER can be supplied for inch shanks also on request. Generally SIDE LOCK HOLDER is available with dia. 6,8,10,12,16,20,25,32 ,40 & 500mm shanks. Shank of the cutting tool to be used in SIDE LOCK HOLDERS will have taper flat on shank for better gripping purpose.SIDE LOCK HOLDER will be supplied with AT3 class Taper. SIDE LOCK HOLDER'S maximum run out of the internal taper with respect the external taper 0.005. What is Side Lock Holders? Where can I buy Side Lock Holders Online?